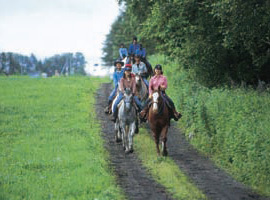 Horse riding on horseback, you can observe nature with a different line of sight from the usual. There are various horse riding facilities along the highway, and the kinds of horses are various. A famous quarter horse for Thoroughbreds and Western competitions known for horse racing, the recommended one is Hokkaido's unique horse "Dogoko (daigo)". 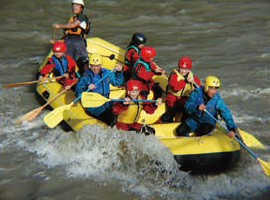 A thrilling leisure sports "rafting" that rides in a rubber boat in multiplayer and goes down the torrent river of nature. Along the highway, you can enjoy rafting at Sorachi River and Tokachi River. Many artists gathered along the beautiful scenery roads and left their works. Asahikawa has a museum of snow and Miura Ayako Memorial Literature Museum. Biei has photography gallery "Maokodan" of Maeda Shinzo, Furano has Furano theater workshop and Fumino Goto art museum of Japanese painter who have given a lot of excitement to Furano. The Obihiro Centennial Memorial Museum introducing the history of Tokachi is also loved by locals. Starting with milking of cows, contact with goats and sheep, butter making, potato digging, Hask and strawberry hunting. There are many facilities along the Garden Road where agriculture and dairy experience can be experienced. In my everyday life, I can only learn the importance of lives and foods that I can not learn easily, but it is a pleasure of this region where there are many nature. 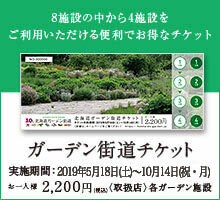 Plants that can plant trees as an environmental contribution activity are also popular.